The neuroscience theme embraces neurology research, across the whole translational spectrum from basic science to clinical trials. The neuroscience theme embraces neurology research, across the whole translational spectrum from basic science to clinical trials and is funded by MRC, BBSRC, Wellcome, CR-UK and NIHR. Our research is disease orientated and looks at underlying mechanisms such as cell death and stem cells helping to understand the disease areas we focus on i.e. neurodegenerative diseases as well as disorders of myelinating cells, ischemia and brain tumours. Neurodegenerative diseases include Multiple Sclerosis, Alzheimer's, Motorneurone and Parkinson's diseases. Our aim is to develop new treatments for these potentially devastating conditions, and test treatments in clinical trials using the best methods available. This involves developing new ways of doing clinical trials, linked to a programme of laboratory research in neurodegeneration. Finding new drug targets and new targeted therapies through understanding the disease mechanism and then translating these new treatments into the clinic is our focus. We have strong links with PU PSMD other research themes especially Infection, Immunity and Inflammation​, Diagnostics and Cancer. We are also part of the faculty-wide research into clinical neuroscience. Like all living organisms, we humans need to extract energy from our environment to escape death and the cellular mechanisms by which this energy is transduced and conserved are thus critical to our survival. As the powerhouses of the cell, mitochondria play a key role in cellular bioenergetics and mitochondrial dysfunction has indeed been linked to a range of diseases. Research in the Affourtit Lab aims to establish the role of bioenergetic failure in the Metabolic Syndrome, a cluster of medical disorders that collectively increase the risk of developing type 2 diabetes and cardiovascular disease. Current projects explore how mitochondria may mediate obesity-related defects in insulin secretion by pancreatic beta cells and in the insulin sensitivity of skeletal muscle. Understanding mechanisms of insoluble protein aggregates formation and cellular degeneration in the human brain is one of the most pressing questions of clinical neurobiology. We are trying to understand the process of alpha-synuclein aggregation in the development of neurodegenerative disorders such as Parkinson's disease and dementia with Lewy bodies. In particular, we are looking for the reasons of a selective vulnerability of neurons to the toxic insult caused by aggregating proteins and whether dis-aggregating strategies could be beneficial in these conditions. To address this, classical neuromorphology, biochemistry and cell biology techniques are used in a range of in vitro and in vivo models, including human post-mortem studies, animal models of neurodegeneration and cell culture assays. The controlled generation of new neurons and glia cells in the brain from Neural Stem Cell (NSC) progenitors is crucial not only during embryonic development but throughout adult life. Deregulation of adult NSCs impacts on normal brain function and can lead to a variety of brain disorders. The development of NSC-based therapies, holding promise towards replacement of dying or malfunction brain cells and more effective brain tumour treatments, depend on our understanding of how NSCs are regulated. Our team research focus is to reveal and understand the signals controlling Neural Stem Cell mitotic activation, cell fate and lineage maturation in both normal and pathological conditions, such as during brain tumour formation. We take advantage of one of the best in vivo genetic models available, the Drosophila central nervous system, and translate our findings to the human brain using human brain cell cultures, tissues and tumour samples. 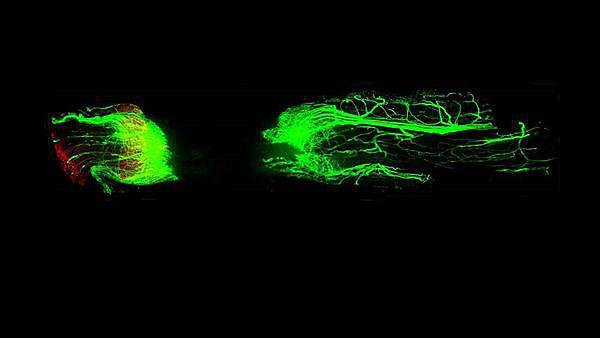 Image shows Neural Stem Cells (green, GFP) inside the Drosophila brain, some about to proliferate (red, CyclinB). Understanding the workings of the human central nervous system (CNS) with its millions of neurons generating trillions of connections is a formidable challenge. Fortunately, to uncover the basic rules, we can turn to simpler organisms. I am using the simple fruit fly Drosophila to study evolutionary conserved mechanisms in CNS development and disease. Using classical genetics, molecular biology, transgenics, micromanipulation, CrispR/ Cas9 and single cell transcriptomics I study the embryonic development of the CNS to understand how damage to it can be repaired. I also investigate the transcriptional program that ensures the correct formation of neural networks controlling movement. My research focuses on studying how developmental axon guidance cues control adult peripheral nerve regeneration. Peripheral nerve transection injury following trauma often generates a nerve gap between the proximal and distal nerve stumps, which prevents correct re-targeting of regenerating axons into the distal nerve. Consequently, effective repair following peripheral nerve transection remains a significant challenge in order to achieve precise axon re-targeting into the distal nerve stump and regain full nerve function following such an injury. During the nervous system development, precise axon targeting is controlled by several families of axon guidance molecules such as Netrins, Slits, Ephrins and Semaphorins. The synergistic effect of these molecules has an incredible ability to control precise axon targeting over long distances. Recent studies have found that Netrins, Slits, Ephrins and Semaphorins are differentially and topographically expressed in the injured peripheral nervous system. We aim to understand their molecular and cellular mechanisms in peripheral nerve regeneration and then develop novel therapeutic strategies to guide regenerating axons across peripheral nerve gaps. Regenerating axons crossing a 2mm mouse sciatic nerve gap. White matter inter-connects the complex human cerebral cortex. It makes up 50% of our brains and contains axons, which mediate action potential conduction, and glial cells, which support the axons. The brains of rodent models of disease contain much less white matter than does the human brain and heavy use of these models has therefore grossly under-estimated the significance of white matter pathology to human health. White matter represents a poorly understood frontier in the science of brain disease and the Fern laboratory focuses on disorders arising from loss of blood supply (ischemia) such as stroke and cerebral palsy, but white matter is relevant to almost all major neurological disorders. Neurodegenerative diseases such as Alzheimer’s, Parkinson’s and Huntington’s disease are characterised by a wide range of symptoms and underlying molecular processes. The observed heterogeneity on geno- and phenotypic level makes it difficult to understand fully the progression of neurodegeneration and to find cures. To connect the different neuropathological features and consolidate different experimental findings, we develop and apply tools of integrative network biology in our study of neurodegeneration. Application of these tools enable us to obtain models of molecular networks that link the different relevant processes and that give us a more holistic view of neurodegenerative diseases. Ultimately, we aim to explore the network models for the discovery of new ways to treat effectively neurodegeneration in the human patient. My main research interest is molecular basis of neuron-glia communication. Glia cells are the most abundant cell type in human brain. Communication between neuron and glia cells is one of the most intriguing processes that happen in the brain. It is mediated through different classes of receptors and release of small double membrane vesicles called exosomes. Study of these mechanisms can help us to understand molecular basis underlying pathomechanisms of brain disorders like Alexander disease, Alzheimer’s, and Parkinson. Alterations in cell surface protein signalling have been implicated in the pathogenesis of neurodegenerative disorders such as Parkinson disease (PD), Alzheimer disease (AD) and motor neuron diseases, but also in diseases such depression, attention-deficit/hyperactivity disorder (ADHD) and schizophrenia. My research group focuses on investigating the cross-talk and function of the glial cell-line derived neurotrophic factor (GDNF) receptors in the nervous system. In addition, we analyse the function of different intracellular proteins encoded by genes mutated or linked to PD. We study their signalling mechanisms on a molecular and cellular level as well as in rodents. My research is on neuromuscular disease, especially motor neuron disease and neurooncology. Current work on motor neuron disease is mainly clinical and includes genotype-phenotype analysis and clinical trials. In neurooncology we focus on cell biology studies to find and validate new therapeutic targets as there is a great medical need to find new treatments. Autophagy is an intracellular bulk degradation system mediated by lysosomes, and its substrates include long-lived cytosolic proteins, intracellular pathogens and damaged organelles. Autophagy is involved in many biological processes of normal physiology, such as mitigating metabolic stress, degradation of aggregate-prone proteins (e.g, mutant huntingtin), and tissue homeostasis. Defects in autophagy process are associated with numerous pathophysiologies, including neurodegenerative diseases and tumorigenesis. The research in our lab currently focuses on autophagy regulation and its roles in neurological diseases. My research interests are in the control of myelination and repair in the peripheral nervous system (PNS) as well as drivers of cell proliferation in tumours of the nervous system. We study the biology of the Merlin tumour suppressor and how this protein regulates cell behaviour. We use several different model systems, such as transgenic mouse models and human tumour cell culture, to understand how loss of Merlin, and dysregulation of Hippo pathway signalling, regulates peripheral neve development, PNS repair and how tumours such as schwannomas and meningiomas arise and grow in the nervous system. The identification of new targets for drug treatments may be used to both improve the outcomes of PNS repair as well as novel therapies for nervous system tumours.